With the present abundance of bath accessories, master the technique Lush columns Crocheted, intending to create a bastHands, sometimes it seems unreasonable. To get rid of this feeling, just look at the cost of the finished washcloth. And if you take into account that it is needed not one, but for each member of the family, and you need to change it more often, it turns out that you can save a substantial amount on bast shoes alone. If you have at least a little bit of skillWith threads and knitting needles, then the sponge can be knitted with their own hands in just a couple of hours. And if the result satisfies you, then it can be put on stream, and bestow all your friends and loved ones with bathing accessories of an exclusive kind. 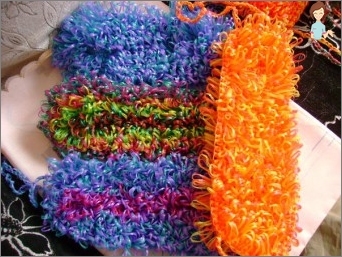 Before you bind a synthetic loofahNeed to pay special attention to the choice of the threads themselves. The fact is that the necessary material is not sold in the shops for needlework, and it must be sought in household shops. 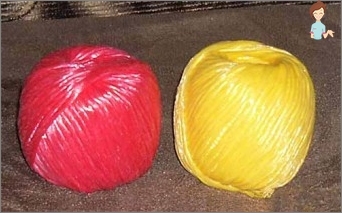 There is sold a thread made of polypropylene, or simply put, a conventional economic twine, which has a different coloring. Here it is we need, that's just its thicknessMay not be suitable for such a delicate product as a washcloth. Practice shows that a bath accessory, studiously tied by one's own hands using a too thick synthetic thread, turns out to be very tough, and you can wash it, perhaps, with an elephant. 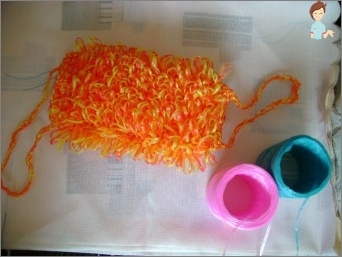 Ideally, you need to buy a thinner twine, notTwisted from several fibers, but representing something like a thin ribbon. It is better to take it with a decent stock, because because of elongated loops a large consumption of material is obtained. Fluffy sponge knitting needles, which can be tied,Using our master class, is done with the help of five identical spokes. The latter need to be short, without any scaffolding, limiters or tips. Ideal are knitting needles, originally designed for tying hosiery. Another pair of similar tools, but alreadySomewhat thinner, it will be required for knitting ribbons, which can be replaced by ropes made with the help of a hook, or on strong non-staining ribbons of the desired color. The final thickness of the spokes depends entirely onAddition, viscous what density you intend to knit. If the final product should be very dense, then the tool should be taken as thin as possible, and vice versa, soft and loose wool should be knitted with the thickest knitting needles. A network of syntheticBath accessories, having a different density throughout its length. It is worth noting that this gives the washcloth an interesting appearance and enhances its user characteristics. Any scheme of knitting a fluffy sponge with spokes provides for the presence of elongated loops, which not all are obtained from the first time. To begin with, try your skills and sharpen your skills on ordinary threads. For the sample, dial not more than 12 loops, the first row of which is tied with the front loops. Inner is tied with the wrong, that is, according to the drawing. At the very beginning of the new series, tying one face loop and holding a loose thread behind the canvas, the thumb or forefinger of the left hand, it is necessary to pull out the loop, transfer it and leave it before work. The next loop matches the pattern, that is, the front one, and so on until the end of the row. 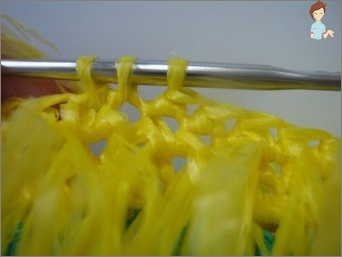 Turning the canvas, everything is knit according to the pattern, which is necessary to fix the elongated loops. In the event that the master class on manufacturingSuch bath accessories helps to make a loofah for the child, it is recommended to change the twine to any cotton yarn. Moreover, the finished product, with the help of loops and columns of hooks, you can decorate with animal muzzles, hearts and other decorative additions. As you can see, nothing difficult is toForces to replenish stocks of bathing accessories, no. It is enough to buy the appropriate material, spend a little time for training and a couple of hours to make the washcloth itself. The latter will not only be profitable, but also much more durable than the store analog.